Papadima-Sophocleous, S. (2013). Self-Access Language Learning Programme: The case of the English Language Voluntary Intensive Catch-up Study. Studies in Self-Access Learning Journal, 4(2), 125-140. This study investigated whether and to what extent an English Language Voluntary Intensive Independent Catch-up Study (ELVIICS), a Self-Access Language Learning (SALL) programme, was effective in helping first-year Greek-Cypriot students fill in the gaps in their English language learning and come closer to the required language competence level of the Common European Framework of Reference (CEFR) B1 level. It also examined students’ perceptions of such learning. The students followed the ELVIICS at their own pace, time and space until they felt they had reached the aimed level. Analysis of the achievement test results revealed that students’ language competence improved and reached the required level. Additional quantitative data also revealed that students felt ELVIICS also helped them improve their self-confidence, computer skills and autonomous learning. Moreover, students claimed that ELVIICS assisted them in getting through and successfully completing their compulsory course. In many universities, language centres and language resource centres, there are programmes offered to students with independent or autonomous learning components integrated in them, or as self-study or independent study programmes. These are usually either supported or not supported. The degree and type of support varies. These programmes usually describe what the students are expected to work on. For example, they provide students with instructions or guide packs, which advise them how to use the resource centres independently. Some of them are linked to the curriculum or they are standalone. The current article describes the design, development and implementation of an English Language Voluntary Intensive Independent Catch-up Study (ELVIICS) programme, offered by the Research and Cooperative and Interactive Language Learning Centre (ReCILLC) of the Cyprus University of Technology Language Centre. The aim of the research project was to establish (a) whether and to what extent a systematically designed programme would be effective in helping students fill in gaps in their English language learning and come closer to the required B1 Common European Framework of Reference (CEFR) level of their compulsory English for Academic Purposes (EAP) course, and (b) students’ perceptions of such learning. SALL is based on the theory that foreign language learners learn better if they have a say in how they learn, for example, in choosing from among different resources that are available during independent study (Klassen, Detaramani, Lui, Patri, & Wu, 1998). SALL is therefore also based on the learner-centred approach, which supports learning based on students’ active rather than passive participation (Gibbs, 1995), on student (rather than teacher) responsibility for learning and on autonomous learning. SALL follows this concept, which focuses on student responsibility and active participation for his/her own learning (Carter, 1999). It is closely related to a learner-centred approach and self-directed learning. In this student-centred environment students basically set their own curriculum. First, they analyse their strengths and weaknesses and clarify their objectives. Then they select materials relevant to those objectives, choosing not only the medium best suited to them, but also the level appropriate to their ability. Time management plays a significant role in Self Access (SA) learning. Students need to set priorities, decide when and where to study, and determine how to pace their learning. There is a system of record-keeping to indicate their progress. Finally, they evaluate their learning and, if necessary, change their plan of action after receiving feedback from a counsellor. Earlier research investigated different aspects of SALL: different types of learner preparation and support (Esch, 1994), methods of monitoring learner progress (Martyn, 1994), the role of technology (Morrison, 1999), philosophy and practice (Benson & Voller, 1997), the consequences of the role change that may be implied in SALL (Cotterall, 1998), students’ attitudes towards self-access mode (Klassen et al., 1998), efficiency and effectiveness, (Gardner, 1999), improvement of effectiveness through learner training (Cotterall & Reinders, 2001), definitions and measurement of self-access centre effectiveness (Gardner, 2001), ongoing support in using the self-access study centre (McMurry, Tanner, & Anderson, 2009), and change of stakeholders beliefs in SALL in tertiary institutions (in Hong Kong over a period of 15 years) in four key areas of effectiveness of self-access centres (materials for self-access learning, integration of self-access centres and language learning courses, motivation and the effectiveness of a self-access centre) (Gardner & Miller, 2010). According to Cotterall and Reinders (2001), much research on evaluating SALL has concentrated on matters of efficiency. Although it has been suggested that the lack of published research on their effectiveness is due to difficulties inherent in evaluating it on the whole (Gardner, 1999) and to the fact that measuring effectiveness requires evaluation of quality rather than quantity, this is more complicated to carry out (Gardner & Miller, 2010). It is evident from the existing literature that there is a need for further experimental research on SALL, on the systematic development of SALL self-access programmes, their effectiveness, and how students perceive them. This study took place in the Cyprus University of Technology in the Republic of Cyprus. When starting English (compulsory for two semesters for all first-year students), based on an average of 4 to 12 years of English study in primary and secondary schools (Council of Europe, 2005), students are expected to be at a CEFR B1 level. The placement test revealed that the majority of students are indeed at B1-B2 level (Independent User: Threshold and Vantage, respectively). However, there were a number of students at A1.1 (Basic User: Breakthrough) and/or A2.1 (Basic User: Waystage) levels (Figure 1). For this reason, while these students followed their B1 English for Academic purposes (first semester) and B2 English for Specific Purposes (second semester) compulsory courses, they needed support to quickly catch up by filling the gaps of their earlier learning and reaching the expected level as best as possible. Therefore, a SALL programme was developed. The ELVIICS programme included activities to develop all skills and language aspects, was based on the A1 and A2 CEFR levels and included achievement tests. It was offered during the academic year 2011-2012. In this study the Empirical Research method was used. In order to answer particular questions, the research was based on original quantitative data such as learners’ questionnaires and diagnostic and achievement tests (Brown & Rodgers, 2002). 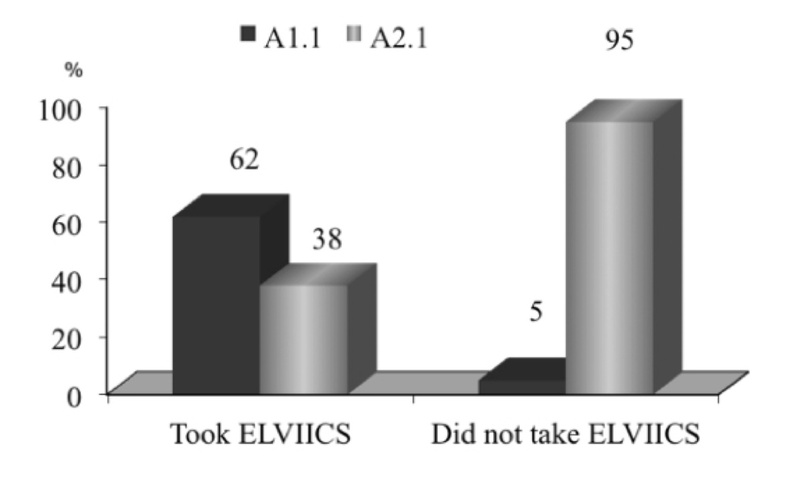 The aims of the study were (a) to explore the effectiveness of ELVIICS on students’ English language level of competence and (b) to establish how the programme was perceived by students who did not have much prior experience in autonomous learning. The participants consisted of fourteen female and seven male first-year students studying in diverse fields of study at the Cyprus University of Technology. Their ages ranged from 18 to 35. As they had studied English earlier for at least six years, they were considered false beginners. Only a few of them had computer and Internet use awareness. Consequently, the majority had to make an extra effort to also develop computer skills in order to be able to follow the programme. A review of the existing Cyprus University of Technology library and Language Centre ReCILLC English A1 and A2 materials was carried out to find suitable materials such as textbooks, workbooks, CDs and DVDs, etc. to be used for ELVIICS. An online search was also carried out to find online suitable and relevant resources. The printed materials consisted mainly of commercial sets of materials (textbooks and workbooks). The electronic materials were CDs and DVDs accompanying the sets of printed materials. The material also included online resources, carefully chosen to complement the other resources. All materials dealt with topics concerning real life contextualised communicative settings and situations relevant to students’ personal, social, and educational context, everyday life, interests and compulsory field of study. They were informed by current theory and practice in L2 curriculum development, and CEFR A1 and A2 levels. They included listening, writing, reading, speaking, grammar, and vocabulary activities. Activities included matching, gap filling, short answers, multiple-choice, sentence/form completion, clickable text on screen, clickable image on screen, video viewing, games, drag-and-drop exercises, cloze tasks, crossword puzzles, flash cards, virtual postcards, comics, etc. Online dictionaries were also recommended to students, aiming to the enrichment of students’ vocabulary and autonomous use of it. All of that was systematically and methodologically chosen and put together in the form of a study pack. The ELVIICS pack also included commentaries and guiding notes written by the Cyprus University of Technology Language Centre staff, experts in curriculum development and the use of new technologies in language learning, which aimed to help students in using resources and working independently. It is generally accepted that there is a number of learning styles. On the same token, there is no one or no perfect way to learn a language. For this reason, no particular method was imposed. The aim was to create learning opportunities. Students were given ample activities, tools and materials, which catered to their different learning styles and promoted autonomous learning. In ReCILLC, students used four computers with wireless password Internet access. The technical advisor uploaded all audiovisual material on the computers’ desktop, including online dictionary links. The ELVIICS pack in digital format was saved on their desktop for easy access to the programme and the online activities. The research instruments selected consisted of a pre-project questionnaire, a placement test, the advisor’s observation journal, and the achievement tests. At the beginning of the academic year 2011-2012, all first year students from five different schools and ten different disciplines within Cyprus University of Technology took an English placement test, before starting the compulsory EAP course. The placement test consisted of three parts: grammar-vocabulary, speaking, and writing. The grammar-vocabulary part included a multiple-choice set of 50 questions. Its aim was to verify the language level of all students. At the beginning of the study, the students were allotted some time with the advisor in order to become familiar with the notion of independent and autonomous learning, the ELVIICS pack, the ReCILLC, the library, the online resources and the ReCILLC appointment system. Students were guided as to how to work autonomously and were monitored at all times. The advisor also monitored students’ progress at regular intervals (appointment and attendance-sheet system) and kept assisting them with their independent learning, upon their request. Students were given ample materials and tasks at the A1 and A2 English competence levels in all language areas. During the ELVIICS programme, students used their ELVIICS pack, the printed and electronic materials found in the ReCILLC and online materials of the Cyprus University of Technology Language Centre. They were able to store the ELVIICS pack on their USB sticks in order to study outside the ReCILLC, if they wished to do so. The students could make their own planning as far as their studying was concerned. They could study at the ReCILLC by appointment, at home or in the Cyprus University of Technology library at any time. They were advised to engage in the number and type of activities that would best reflect their learning styles and would help them to independently reach the expected language level. They were fully free to choose what they wanted to use or were guided or supported to find them when they chose to seek guidance. Students kept their work in a portfolio, consisting of printed and electronic work. When students felt they had practised enough and had reached the required level, they took the achievement test of the level they did their independent study on (A1 or A2). A1 and A2 Common European Reference of Languages level achievement tests consisted of six parts: listening (2 activities), speaking (exchange of information (5 scenarios)), role-play (6 scenarios), reading comprehension (2 activities), writing (2 activities), and language (4 activities). The objective was to improve the students’ English language level and ensure that they reach A1 and A2 CEFR levels. Additional objectives were to pass their compulsory English course, improve their digital literacy and learn to work independently. Students recorded their study time on a timesheet. They also kept a task portfolio as evidence of their work. A post-project questionnaire provided information regarding the students’ perceptions toward the experience of such a programme. In order to collect in-depth information on variables such as students’ progress, attitudes towards some issues and on other elements, the academic advisor observed and kept notes throughout the duration of the ELVIICS project. Ninety-five percent of those who were placed at A2.1 level chose not to follow the programme. The assumption was that they thought they were close to B1 level, the level required for their compulsory EAP course. Therefore, they did not feel the need to do the course (Figure 3). Sixty-two percent of students who chose to follow the ELVIICS programme were at the A1.1 level, and 38% were at the A2.1 level. One out of three students who enrolled in the programme completed it (Figure 4). From the data analysis, it was revealed that, in comparison with previous years, all students of year 2011-2012 who did ELVIICS passed their compulsory EAP course. In previous years, not all students who were placed in A1.1 from the placement test had passed, and therefore were not able to move on and take English for Specific Academic Purposes during the 2nd semester. The average final score for students who commenced the programme during the 1st semester EAP course but completed the programme during the 2nd semester English for Specific Academic Purposes course, was estimated at 5.8 out of 10. Finally, those students who completed the ELVIICS programme passed with higher marks than the ones who did only part of the programme. 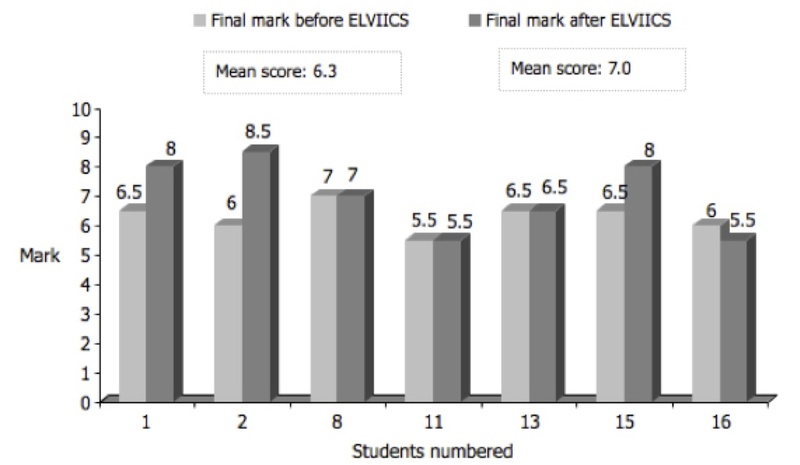 However, the average final English for Specific Academic Purposes course score of the students participating in ELVIICS increased from 6.3 (EAP) to 7.0 (Figure 5). To answer the second question of this study, we analysed the data provided by the questionnaires. Students referred to different aspects of the programme and found educational games to be the most useful activities (57%), followed by listening comprehension and vocabulary matching activities (43%) respectively. They found sound and visual matching activities to be the third most useful (43%), and vocabulary fourth (29%). 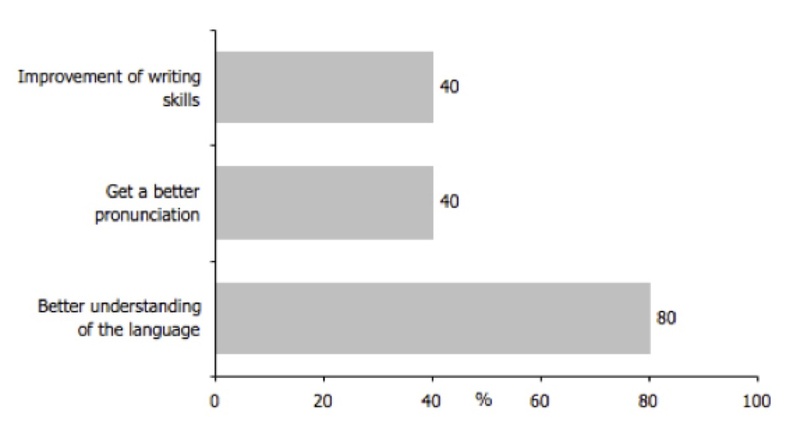 According to students’ responses, the combination of printed and electronic material helped them “much” (14%) and “very much” (86%) in their learning (Figure 7). Students claimed the variety of materials made it more interesting (50%). At the same time, it contributed towards better comprehension (Figure 8). Students also referred to what helped them most in the programme. 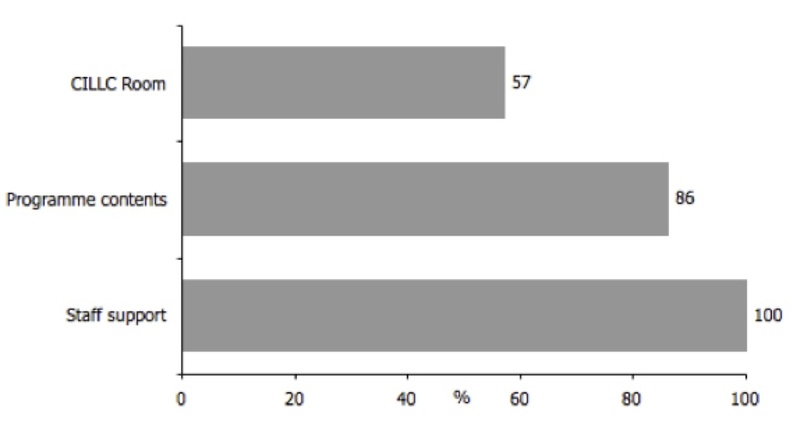 They claimed that staff support and programme content were the elements which helped them the most (100% and 86%, respectively) (Figure 9). The vast majority of students (71%) said the programme helped them improve their English “very much” and 29% said “a lot”. 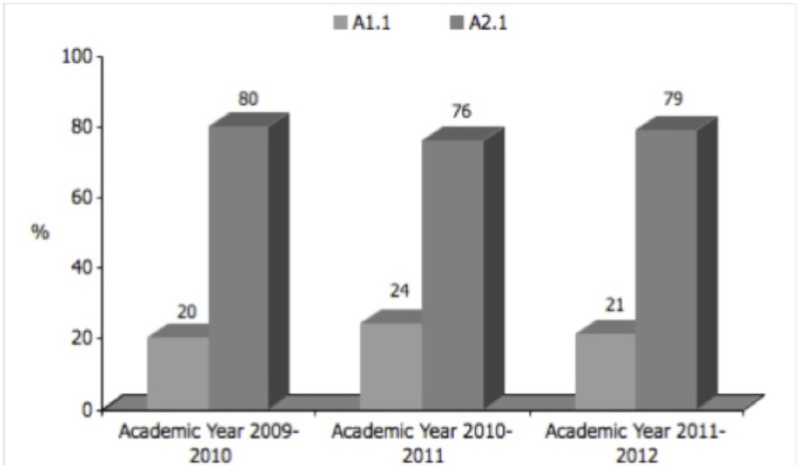 This improvement was mainly in the form of better understanding of the language (80%), pronunciation (40%) and improvement in writing (40%) (Figure 10). All students agreed that the programme was well organised. Most students (86%) also maintained that the programme did not need any changes to improve it. All students were in favour of the programme continuing because, as argued, it generally helped them improve in English (86%) and helped their self-confidence (36%), Information and Communication Technology ICT skills (27%) and autonomous learning (18%). They also supported it because it was interesting, exciting and amusing (36%), and its interactive activities and games were motivating (36%). Students were finally asked if the ELVIICS programme had helped them pass their EAP English course. The trend was the same for students who had started the programme but not completed it. All students indicated that the programme had helped them get through their EAP compulsory course. Students were placed at the A1.1 or A2.1 level at the beginning of the course. At its completion, they passed the A1 and A2 achievement tests respectively. The results suggest that the ELVIICS programme supported the students to successfully fill in the gaps at level(s) A1 and A2 in their English language competence. Another positive result was that according to data, it was evident that, in comparison with students in previous years who were placed below B1 and did not have a systematically designed programme to support them, all students who completed the ELVIICS programme passed their compulsory EAP course. Even those who did only part of it passed their EAP and English for Specific Academic Purposes courses. To establish students’ perceptions of the effectiveness of the ELVIICS programme, quantitative data from end-of-course student questionnaires were collected. Data revealed that students said the programme helped them not only to improve different aspects of their English such as comprehension, pronunciation and writing, but it also helped them improve their ICT skill, self-confidence, and autonomous learning. The aspect of the programme they liked most was the staff support, the programme organisation and content. Students’ positive attitudes towards the ELVIICS programme, supported by the perception of improvement in English proficiency, suggest that they felt the programme was effective. All students who responded to the questionnaire agreed that the ELVIICS programme should continue to be offered again in the future. In retrospect, one always finds aspects which could be improved. One of the limitations of this study was the small sample size, which did not allow for any generalisation. For this reason, the results should be interpreted with caution. The small number of students taking the ELVIICS programme also did not fully preserve anonymity. There were some factors which might have influenced the validity of the study. According to students, a common constraint was that their busy schedule did not allow them to work on a regular basis. The disruption created during the mid- exam period also made the smooth continuation of students’ independent study more difficult. According to the advisor’s observations, students needed to develop self-management and organisation skills, as well as responsibility for their own learning. The ELVIICS programme satisfactorily met its expected outcomes. The results show that the learning programme had a positive impact on the development of students’ language competence. A1.1 and/or A2.1 students completing the A1 and/or A2 course passed the A1 and/or A2 achievement tests successfully. Moreover, all passed their compulsory B1 course. Students also claimed that the programme helped them improve their autonomous learning skills and digital literacy. Since Greek-Cypriot students have little experience in self-access learning, learning management and organisational skills, the advisor in this study indicated the need for more training in these areas. In this regard, such training can be further and systematically designed and incorporated, not only in the initial and formative stages, but also in the method of learning itself. ELVIICS was offered again during the academic year 2012-2013. The major conclusions drawn from this study were that a systematically and well-designed autonomous learning programme of a SALL centre can have a positive impact on various aspects of students’ performance: students’ improvement of language competence and language learning, on self-management, on organisation, responsibility in one’s own learning, etc. Salomi Papadima-Sophocleous is an assistant professor in the field of Applied Linguistics and the Director of the Cyprus University of Technology Language Centre. Her areas of interest, research and publications are related to second language L2) teaching, L2 curriculum design, L2 curriculum development implementation and evaluation, computer-assisted language learning, assessment and testing, autonomous learning, teacher education and language programme quality control. Brown, J., & Rodgers, T. (2002). Doing second language research. Oxford, UK: Oxford University Press. Cotterall, S. (1998). Roles in autonomous language learning. Australian Review of Applied Linguistics, 21(2), 61-78. Gibbs, G. (1995). Assessing student centred courses. Oxford, UK: Oxford Centre for Staff Learning and Development. Martyn, E. (1994). Self-access logs: Promoting self-directed learning. In D. Gardner & L. Miller (Eds. ), Directions in self-access language learning. Hong Kong: Hong Kong University Press, pp. 65-77. Morrison, B. (Ed.). (1999). Experiments and evaluation in self-access language learning. Hong Kong: HASALD.